Poltu Quatu has a spectacular view on Caperera island. It is located about 4 km. from Porto Cervo, 2.5 km from Baja sardinia and 15 km from the "Pevero Golf Club". A natural bay, Poltu Quatu is an ideal destination for those travelling with their own boat, who wish to use the excellent services of the Marina dell'orso and the luxury of the 5-star Grand Hotel Poltu Quatu. Go towards the "Costa Smeralda" by taking Route 125. At the intersection of Portisco, turn right on regional route 59 towards Porto Cervo. Follow this road of breathtaking panoramas and the directions for Porto Cervo (and occasionally Poltu Quatu). 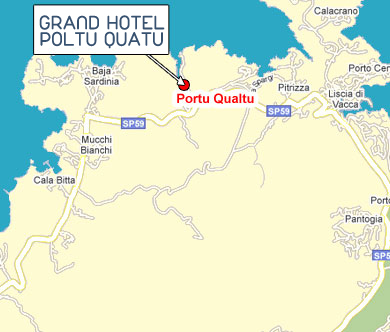 Once past Porto Cervo continue on for 3 Km (follow road signs for Poltu Quatu). During summer, the scenic route is often very crowded. We suggest that you do not take the turn at Portisco; go straight towards San Pantaleo and follow directions towards Baja Sardinia. Staying on the same road, proceed past Baja Sardinia for about 3 km to reach Poltu Quatu.